RTE will mark the passing and celebrate the life of the renowned Irish architect Kevin Roche when it screens ‘Kevin Roche: The Quiet Architect’ this Tuesday night, March 19th on RTE One at 23.10. 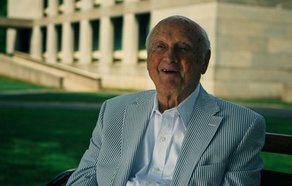 Irish born Kevin Roche, who died in Connecticut USA on 1st March at the age of 96, reached the very top of his profession, culminating in being awarded the Prizker Prize in 1982, the most prestigious in the world of architecture. His passing was marked by glowing tributes from contemporaries, and the many people who knew him, worked with him, and studied his output over an exceptional 70 year career. "(It was) an honour and a pleasure to have made a documentary about him. It was an eye-opening experience to spend time in his company, and get a personal insight into his life and working methods. We were grateful for the support of Fis Eireann/Screen Ireland, the Ford Foundation, Convention Centre Dublin and of course Kevin's family for bringing his story to the big screen and creating something that we can all remember him by"
The documentary’s subject, Kevin Roche, who celebrated his 96th birthday on 14 June, is a highly influential architect whose work remains just as relevant and thought provoking today as at any time in his 70 year career. This has just been re-affirmed in the most contemporary of settings, the 2018 Venice Architecture Biennale (May 26th –Nov 25th), the world most prestigious architectural exhibition. The Biennale’s curators selected an extended sequence from the documentary focusing on his design for the Ford Foundation (1968) to screen for the duration of the exhibition. Directed by Mark Noonan, the film includes a crew of Kate McCullough; Director of Photography, Jordan Montminy; Editor, Keith Grainger; Sound & Grip, Rob Flood; Additional Photography, David Geraghty; Composer, Karla Healion & Marissa Aroy; Production co-ordinators. Kevin Roche was born in Dublin in 1922 and raised in Mitchelstown Co. Cork. His father Eamon Roche after being imprisoned during the Civil War, turned his back on politics and became a prominent local businessman. One of Kevin Roche’s first architecture projects was to design a piggery for his father. Roche received his undergraduate degree in architecture from University College Dublin in 1945. After short spells working for Michael Scott in Dublin where he contributed to the distinctive design of Busaras, and Maxwell Fry in London, he did post-graduate studies under Mies Van der Rohe at the prestigious Illinois Institute of Technology. He has won innumerable awards for his designs of over 200 built projects around the world, among them the Pritzker Prize in 1982 (the highest honour given to a living architect), the American Institute of Architects - Gold Medal Award, the American Academy of Arts and Letters - Gold Medal Award for Architecture, and the French Academie d'Architecture - Grand Gold Medal. Some of his best known work includes the Metropolitan Museum of Art in New York which he has worked on for almost 50 years, the revolutionary Oakland Museum of California, the Ford Foundation and United Nations Plaza in Manhattan, A Centre For the Arts at the Wesleyan University, corporate campuses for Bouygues in Paris and Banco Santander in Madrid. His only Irish building, the Convention Centre Dublin went through a lengthy stop-start planning process but finally got the go ahead and opened in 2010. His work has been featured in every major international architectural journal and has been followed closely by publications such as the New York Times and The Irish Times. Roche has been described by Paul Goldberger, a New York Times architecture critic, as “a brilliantly innovative designer; his work manages to be inventive without ever falling into the trap of excessive theatricality.” Roche has also been the subject of special exhibitions at the Museum of Modern Art, the Architectural Association of Ireland in Dublin, and the American Academy and Institute of Arts and Letters. A 2012 exhibition “Kevin Roche: Architecture as Environment” opened at the Yale School of Architecture in New Haven, Connecticut and has been viewed at The Museum of the City of New York, the Building Museum in Washington, and at the University of Toronto. Kevin Roche died in Connecticut, on 1st March 2019 at the age of 96.